If you have developed a cavity, you should seek treatment as soon as possible. In the early stages, Dr. Stephen Lipman and his team can save your tooth with a simple, conservative dental filling. This restoration can strengthen your tooth and prevent the spread of decay. At Family Dentistry of Windsor, PC, in Windsor, CT, we recommend tooth-colored fillings to provide our patients with the best solution available. This material offers a more realistic appearance as well as several health benefits, including a stronger bond with your tooth. We can provide patients with high-quality, natural-looking fillings in just one appointment. Is a Filling the Right Restoration for You? Fillings are typically appropriate if you have a small to medium-sized cavity. A more extensive area of decay will require a larger restoration, such as a crown, inlay, or onlay. Dr. Lipman will take x-rays of your tooth to assess the size of your cavity and to determine if a filling is suitable. Your tooth-colored filling will blend in with your smile, and it will be a near-perfect match to the natural color of your teeth. Before placing your filling, Dr. Lipman will prep your tooth. After administering local anesthesia, he will remove all decayed tissue from the area. He uses gentle techniques and advanced laser dentistry to cause as little discomfort as possible. In addition, he will use conservative methods to create space for your filling. Once your tooth has been prepared, Dr. Lipman will apply the composite resin. This material is added in layers, and hardened with a special curing light. Our team will work carefully to ensure that your filling matches your natural enamel and maintains your proper bite. After any necessary adjustments, Dr. Lipman will polish your filling for a lifelike shine and feel, allowing you to leave our office with an aesthetic, restored smile. The most obvious benefit of composite fillings is aesthetics. Your restoration will blend in with your smile, and it will be a near-perfect match to the natural color of your teeth. Metal fillings will often start to show through your teeth, and can make healthy teeth look gray. In contrast, composite will never alter the shade of your smile and fosters a healthy appearance. Composite filings also important benefits for your long-term dental health. Composite will form a stronger bond directly to the surface of the tooth. Thus, this type of filling can strengthen your tooth more effectively. Meanwhile, composite will not fluctuate in response to heat and cold. In contrast, metal will expand and contract with temperature variations. Over time, these changes can weaken your tooth and cause further damage. 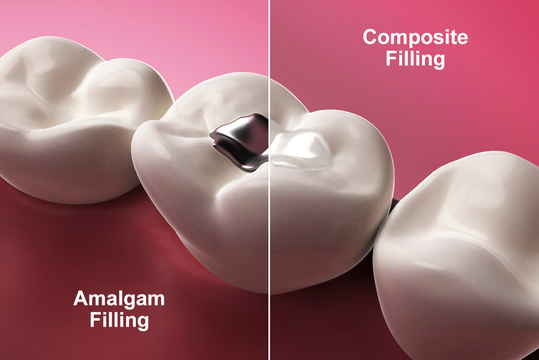 Finally, composite fillings typically require less preparation than metal restorations. Therefore, Dr. Lipman can preserve more of your strong, natural dental tissue. If you have a cavity, we can restore the health and aesthetics of your smile. At Family Dentistry of Windsor, PC, we believe in a conservative approach to dentistry and will only suggest the most appropriate solution to our patients. To learn more about composite fillings and their many benefits, contact us online or call us today at (860) 688-4634.